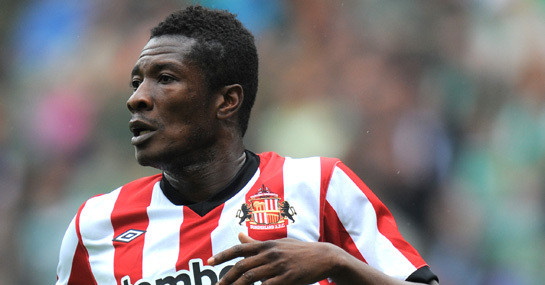 New Sunderland boss Martin O’Neill has admitted he’s looking to try and bring back Ghana striker Asamoah Gyan from his loan move to help the misfiring Black Cats. Gyan is currently playing on loan at Al Ain in the United Arab Emirates after his head was turned by a massive wage hike. Meanwhile, Sunderland are without the firepower they enjoyed last year following the sale of Darren Bent to Aston Villa and the return of Danny Welbeck to Manchester United following a loan spell. With Fraser Campbell still out injured and on-loan Arsenal striker Nicklas Bendtner hitting the net just two times so far this season, it’s clear that O’Neill needs more options up top – and recalling Gyan would appear to be the perfect solution. Speaking to the Daily Mirror, O’Neill said: “His position will definitely be looked at. He started off brilliantly, then things tapered away a little bit. Sunderland have averaged just over a goal per game in the Premier League this season and that average will need to increase if they are to move away from the trouble in which they now find themselves. They are currently just one point off the relegation zone and are 4/1 to be relegated at the end of the season. And O’Neill will have a tough first game in charge against fellow Premier League strugglers Blackburn Rovers in which a win for Steve Kean’s men would see the Black Cats slip into the relegation zone. It’s a tough start for O’Neill but the Northern Irishman is brilliant motivator and Sunderland fans will be expecting a winning start from their new boss – if not a goalfest.